This is the italo electro disco medley version from Theme From Warriors (B. De Vorzon), Escape From N.Y. (John Carpenter) and Assault On Precinct 13 (John Carpenter) on the Zanza label. Awesome! Dear readers, Mister Italo wishes you all a great and warm Christmas Eve with one of my favorite tracks from 2009. We need a lot more of this stuff in the second decade of the 21st century! Amici, last Saturday, my friends from the amazing Overfitted Disco blog celebrated their second birthday with a great online stream party and DJs from the U.S., Finland and Germany. You can now download the stream, don't miss this chance: here. This is a pretty weird, futuristic and awesome space disco smasher you have to know! Ultracool electro/cosmic disco from the late 70s. The Austrian Kurt Hauenstein produced quite a few great albums and was part of the legendary "Sound of Munich" electronic disco scene. Play loud to get the groove! The Robot Scientists are preparing their Musica da Batticuore Mix Nr. 14. To get you glam robots warmed up for this, they decided to give you their mixes Nr. 1 to 13 again! All packed with essential Italo, Cosmic and Synth Disco classics, all mixed live with real vinyl records - a great chance, don't miss this, download periods are limited! You can find all tracklists in their myspace-blog. Salve, this here is a great space disco track from Sylvia Love (I prefer the DUB version though). She released a new track recently, see below, "Cosmic Carousel" - pretty pumping "Space-Electro-Disco" - not bad, but not a classic either, but I post it here to show: the electro-disco revival is in full effect. Another proof: I just saw Casco - Cybernetic Love sell for 90 Euros on ebay. It always was 50, 60 - this shows that the nerds finally realise which the really good tracks are...;). Amici, I strongly recommend you to listen to The Robot Scientists not-from-this-world "Spaced Out Disco" set tonight on their radio show on "Overfitted Disco", the leading "Disco 2.0" blog and web radio from the UK. 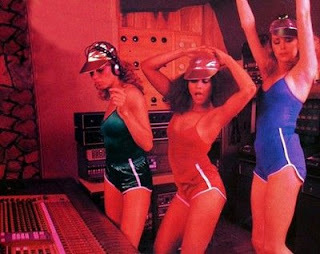 This is how their DJ Sets sound like when they have their "Spaced Out Disco" night with guests from all over the world. In case you don't have time tonight you can also enjoy their mix via their Soundcloud page or directly here in the player! I really have to confess that live performances of Italo Disco artists were once in a while not only cheesy, but simply inacceptable. Like this one. But I love the song. And this live TV appearance is pretty funny, too. This is why I selected it. Anyway, for me, this is one of the top Den Harrow tracks and a top CSD outfit for straight men who want to take the plunge. Go for it!